Heading down to the southwest corner of Sardinia you enter the warm and sandy region of Sulcis. The vines of Sardus Pater is one of Sardinia’s hidden winemaking gems. Situated on the tiny island of Sant’Antioco these visually arresting vineyards produce some of Italy’s best and relatively little-known wines - Carignano del Sulcis D.O.C. Here the Carignano grape (a.k.a Spanish Cariñena/Mazuelo and French Carignan) flourishes in the sandy soils resulting in elegant full-bodied wines which have reached the top of Sardinia’s oenology. Established in 1949, 300 hectares are now planted with vines, mainly consisting of the Carignagno varietal, and the most ancient vineyards are found on Sant’Antioco island. Litereally translated Sardus Pater means Father of the Sardinians and is world renowned for its beautifully refined red wines. Each top quality bottle is made from only the very best hand selected grapes from the finest cultivated ungrafted 80 -150 year old vines. The cooperative estate with its thick planting standards, specialises in producing a low yield per hectare from this sandy soil substrate. This gives rise to the highest quality grapes, rich in the essence of the lush Mediterranean vegetation and formation of perfect polyphenols crucial to the huge success of their wine. 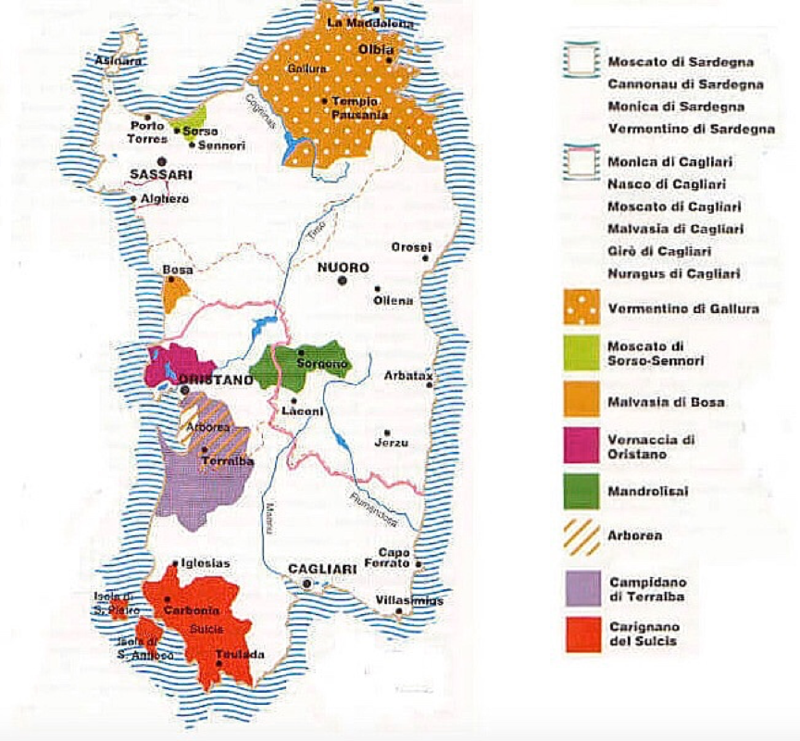 The secret of why the production of Carignano in this region is superior to any other including the French Carignan and Sapnish Cariñena, is a unique combination of the soil and climate. Carignano is a late budding and ripening grape, which requires a warm climate in order for it to achieve full physiological ripeness. This pocket of Sardinia is blessed with a constant mistral winds from all directions, which is vital in keeping grapes healthy. The sandy soils allow the roots of the vines to go deep, easily to find the optimum natural humidity they require to survive. As Andre Jefford writes in Decanter Magazine, “you would be shocked to discover the rich textures and flavours this variety can acquire in Sardinia. In contrast to the Carignan in Languedoc wines of France, which is used to delight as a soaring high note, the Carignano of Sulcis works perfectly well in their own right as a single varietal. The Arruga is 100% Carignano , produced exclusively on the sandy soil of Sant’Antioco island. Aptly named, Arruga means road in Sardinian and S’arruga is the mane of the gravel road leading to the vineyards. The age of the vines that produce the Arruga are approximately 100-150 years old. Sardus Pater take pride in the fact that the production of this wine doesn’t take place every year but instead only when the vintage is right. Alcholic fermentation takes place in steel containers while malolactic fermentation, (the process converting tart-tasting malic acid in the grape must in to softer tasting lactic acid by means of lactic acid bacteria), is performed entirely in barriques. The aging process occurs in oak barrels for 18 months, and a further 12 months in the bottle. When it is made, only around 5000 bottles produced. It has a rich ruby red colour with dark hues. It has a complex nose reflecting the surrounding Mediterranean vegetation. On the palate wild spicy fruit and balsamic notes ring through with a long rich finish. The name of this wine literally means ‘the sands’ in Sardinian, paying tribute to the soil that nourishes these ancient ungrafted vines. The Is Arenas is also made entirely from vineyards found on Sant’Antioco island from thick and sturdy 80 year old vines. Alcoholic fermentation takes place in stainless steel containers and then aged in wood barrels for 12 months. This beautifully bright classy red wine has good acidity with rich maraschino cherry fruit, liquorice and even a note of truffle. It has a wonderful smooth and silky structure with well-balanced tannins that can be enjoyed for up to 5-7 years. Sardus Pater also make a rossato (rosé), which is also made from 100% Carignano grapes. The vineyard describes it as ‘the limit’ between red and white wine’, with a stunning coral pink colour and wonderful raspberry and red fruit on the nose. On the pallet it is fresh and fruity with a lingering savoury finish. The vinestock used to make the rossato is more than half the age of those used for the Arruga or Is Arenas, standing at around 35 years old. The grapes undergo a cold maceration for 24 hours at 8°C. Fermentation takes place in stainless steel containers at 15°C and aging takes place in the bottle for 3 months.